In medium bowl, beat 2 tablespoons butter and the granulated sugar with electric mixer on low speed until well blended and sandy in texture. Add remaining cookie ingredients except food colors. Beat on medium speed 2 minutes, scraping bowl occasionally, until smooth. Stir food color into batter as desired to create bright red color. Stir until well blended. Spoon batter into resealable food-storage plastic bag. Cut 1/4 inch off corner of each bag. Onto cookie sheets, squeeze bag of batter gently to make about 100 1/2-inch circles of dough (about 1/4 teaspoon each), about 1 inch apart. Bake 3 to 5 minutes or until tops spring back when lightly touched. Cool 2 minutes. Gently remove from cookie sheets to cooling racks; cool completely, about 20 minutes. In medium bowl, beat cream cheese, 1/4 cup butter and 1/2 teaspoon vanilla with electric mixer on low speed until well mixed. Gradually add powdered sugar, beating on low speed until incorporated. Increase speed to medium; beat about 1 minute or until smooth. For each whoopie pie, spread about 1/2 teaspoon filling on bottom of 1 cookie; place second cookie, bottom side down, on filling. Store loosely covered in refrigerator. Do your best to keep the amount of dough consistent to ensure an even bake time. 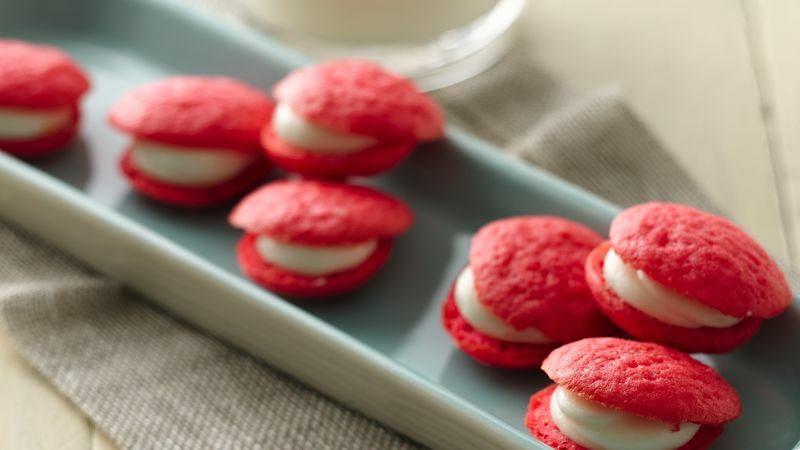 Save time in the kitchen by making a bit bigger bite-size whoopie pies. Use about 1/2 teaspoon dough per cookie. Bake 6 to 7 minutes. For a brighter pop of color, use gel food color in place of the liquid.